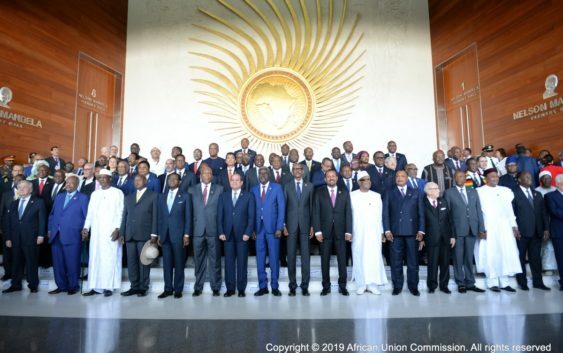 The 32ND African Union Summit for Heads of State and Government of all the 55 African countries is currently on-going in Addis Ababa, Ethiopia. The theme for the 32nd African Union summit is; “The Year of Refugees, Returnees and Internally Displaced Persons: Towards Durable Solutions to Forced displacement in Africa”. During the opening ceremony, chairperson of the African Union Commission Mr. Moussa Faki Mahamat welcomed the assembly of leaders, specially welcoming the new leaders of the Democratic Republic of Congo and Madagascar. He reported on the implementation of the institutional reform of the AU and activities of the union. Further remarking that, the relaunched Peace Fund now stands at $89 million dollars, with 50 Member States contributing. Following on from his address, President Paul Kagame (chairperson of the African Union) invited the special guests to give their address. The invited guests who addressed the 32nd AUSummit were Dr. Tedros Adhanom Ghebrey (Director-General of the World Health Organization), Dr. Bill Gates (Co-Chair of the Bill and Melinda Gates Foundation), Mr. Gianni Infantino (President of FIFA) and Mr. António Guterres (Secretary-General of the United Nations). These guests were invited because of the time, effort and money they have been committing towards ensuring the development of the continent. See more videos from the event . Click the floating icon on the right to subscribe. More so, please share, follow us on Twitter and don’t forget to also like us on Facebook.